David Stout, the YSU Andrews Endowed Chair of Accounting, accepts the American Accounting Association’s Lifetime Service Award. David E. Stout, the Andrews Endowed Chair of Accounting in the Williamson College of Business Administration at Youngstown State University, has received the American Accounting Association’s Lifetime Service Award. 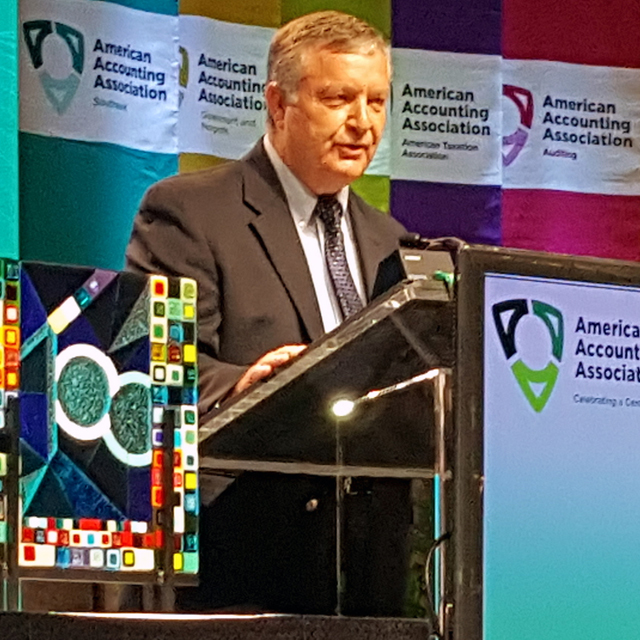 Stout, who received the award at the 2016 AAA Annual meeting in New York, is past president of the AAA Ohio Region, the Teaching, Learning & Curriculum Section of the AAA, and the Academy of Business Education. He recently completed a three-year term as a member of the AAA Board of Directors. He has served as editor of Issues in Accounting Education and editor-in-chief of the Journal of Accounting Education, and has published more than 100 articles in various professional and academic journals. He is a co-author of Cost Management: A Strategic Emphasis, 7th edition. In 2008, Stout was inducted into the TLC Section’s Hall of Honor, and in 2015 he received the AAA Outstanding Accounting Educator Award. The Lifetime Service Award recognizes service contributions to accounting education over a sustained period of time through service to the AAA, service with the education efforts in the profession through involvement with the AICPA, IMA, and other accounting professional organizations, and service with the education efforts of public accounting firms, corporations, and not-for-profit organizations.